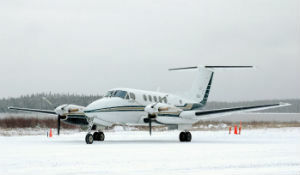 MAG Canada’s Air Charter division (formerly Walsten Air) is based at the Kenora Airport and specializes in charter air transportation throughout Northern Ontario for government and corporate customers. MAG Canada has been a premier supplier of Court Air Charter services to the Ontario government for over 35 years. The Beechcraft Super King Air 200 is a pressurized twin engine turbine powered aircraft. It is configured with executive seating for up to 8 people. It is equipped with high floatation gear for gravel strip landing capability along heated brakes for winter operations. Our aircraft are also specialized to have three bladed props chosen for gravel runway operations to maximize prop and aircraft safety. The Beechcraft King Air 90 was designed to meet the needs of executive and business travel for 4 to 6 passengers. 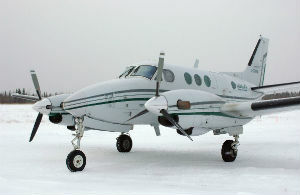 The King Air C90 is an all-weather, twin-engine, turbo-prop aircraft. When on Air Charter it operates in a 6 seat executive configuration. The King Air C90 cruises at approximately 442 km/h, is pressurized, has a service ceiling of 28,000 feet and is air-conditioned. It has an endurance of up to five and a half hours, dependent on speed, load and altitude. High floatation gear for gravel strip landing capability along heated brakes for winter operation. Three bladed props chosen for gravel runway operations to maximize prop and aircraft safety. Real-time tracking via Satellite provides position, speed altitude etc. reports for dispatcher/flight follower every two minutes.